In 12-inch nonstick skillet, heat reserved 1 tablespoon sun-dried tomato oil over medium-high heat until hot. Add bell pepper and onion stir-fry; cook 4 to 6 minutes or until tender, stirring occasionally. Stir in meatballs; cover and cook 5 minutes or until thoroughly heated, stirring occasionally. Spread cut sides of buns with mayonnaise. 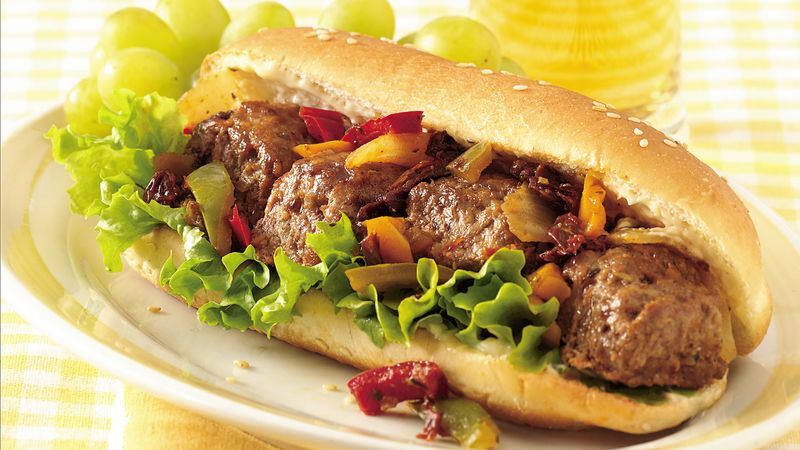 Fill buns with lettuce, sun-dried tomatoes and meatball mixture. Sun-dried tomatoes packed in olive oil and herbs add wonderful flavor to any dish. We add even more flavor by cooking the pepper mixture in some of the flavored oil. Look for jars of these tomatoes near the Italian foods or in the produce department. To toast the buns, place them, cut sides up, on an ungreased cookie sheet. Bake at 375ºF. for 8 to 10 minutes or until toasted. Spread mayonnaise on the toasted buns before filling the sandwiches.